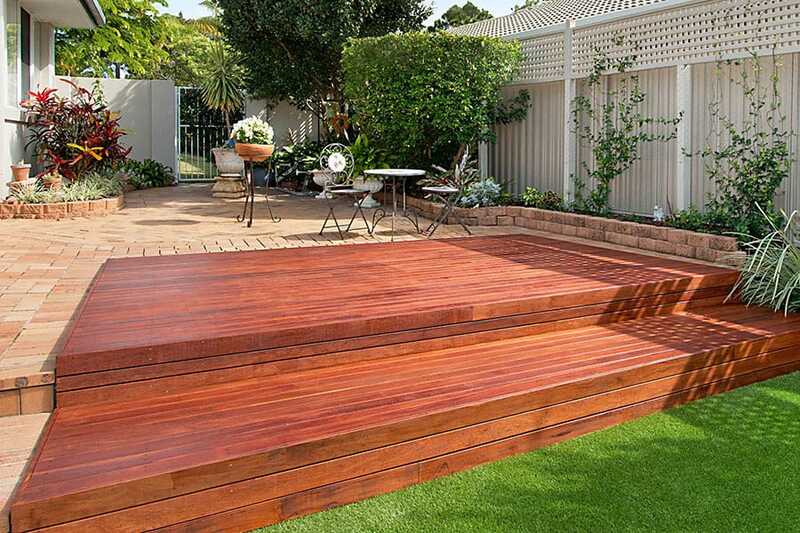 Timber stairs and outdoor stairs can serve many purposes on your new timber deck.  Deck stairs can access a different level on your timber deck, or be an access point to your backyard or they can present a stunning focal point, to the envy of your family and friends. Outdoor stairs are generally made from one of three materials, being hardwood timber, treated pine timber or galvanised steel. Hardwood stair treads are built with hardwood stringers and hardwood timber treads and are fixed together with galvanised stair tread brackets. Hardwood stair treads are generally used when there are more than three timber steps (ie more than 500mm off the ground). They are open, which means that you can see through them, when you are walking up the deck steps. Treated pine stair treads are built with treated pine stringers and treated pine timber treads and are fixed together with galvanised stair tread brackets. Treated pine stair treads are also generally used when there are more than three timber steps (ie more than 500mm off the ground). They are open, which means that you can see through them, when you are walking up the deck steps. 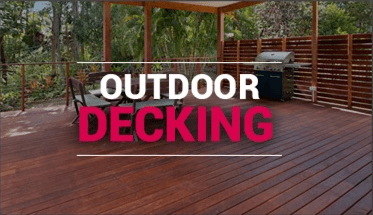 Deck stairs with galvanised steel stringers are built with galvanised steel stringers and then fixed with either hardwood timber or treated pine treads. Deck stairs with galvanised steel stringers are normally used off a first floor (ie around 2400mm off the ground). They are open, which means that you can see through them, when you are walking up the deck steps. 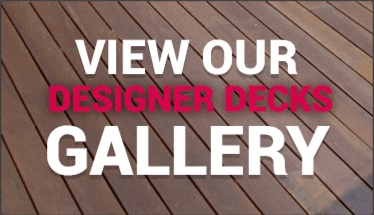 Hardwood stairs – closed in, are built with a timber hardwood frame and then lined with hardwood decking, which will match with your timber deck. Hardwood stairs are generally used when there are less than three timber steps (ie less than 500mm off the ground). They are closed in, which means that you can’t see through them, when you are walking up the deck steps. 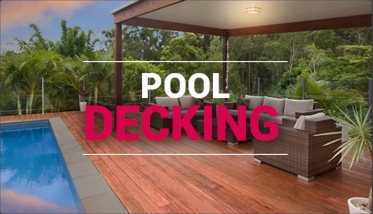 Treated pine stairs – closed in, are built with a timber treated pine frame and then lined with treated pine decking, which will match with your timber deck. Treated pine stairs are generally used when there are less than three timber steps (ie less than 500mm off the ground). They are closed in, which means that you can’t see through them, when you are walking up the deck steps. 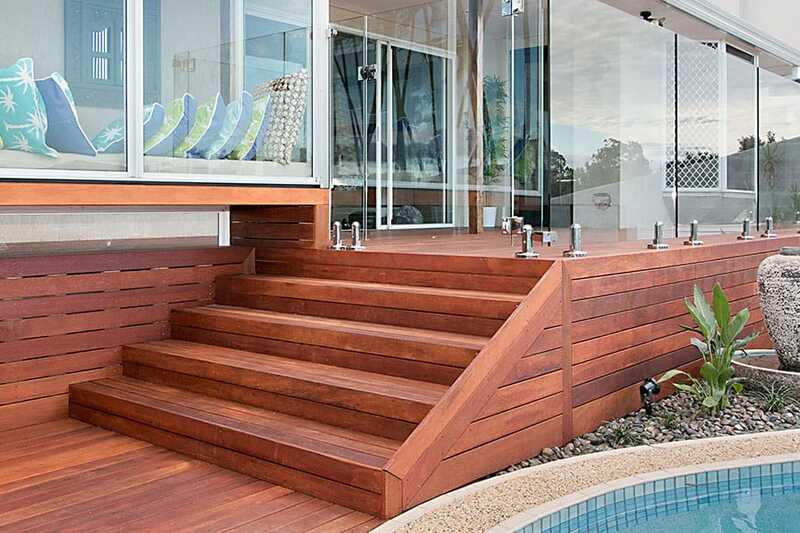 Wrap around stairs are built with either hardwood timber or treated pine timber. They are generally used as a feature and are closed in.